In the 1930s, penicillin was known only as an interesting curiosity. The few scientists who had heard of it knew it as an unusual bacteria-killing substance produced by a microscopic fungus. Nobody had found an effective way to produce penicillin or use it in medical treatments. 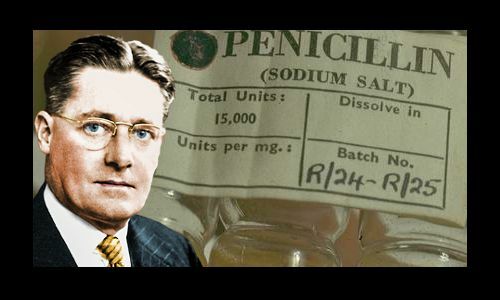 In the early 1940s, Howard Florey and his scientific team transformed penicillin into a potent antibiotic. In doing so, they revolutionized medical science, helped the Allies win World War 2, and went on to save countless millions of lives. Howard Florey, Ernst Chain, and Alexander Fleming shared the 1945 Nobel Prize in Physiology or Medicine: Fleming for penicillin’s original discovery in 1928; Florey & Chain for transforming it into the bacteria-killing magic bullet it became. Howard Walter Florey was born on September 24, 1898 in the city of Adelaide, South Australia. His father, Joseph Florey, was a shoemaker, and his mother Bertha Mary Wadham was a housewife. The family was prosperous – Joseph’s shoemaking business was expanding, opening new branches. Howard Florey in St. Peter’s athletics team. Howard grew up with four older sisters – he had two half-sisters from Joseph’s first marriage (his first wife died of tuberculosis) and two elder sisters. At school (Kyre College Preparatory, then St Peter’s Collegiate) Howard excelled at sport and academically. He won a number of university scholarships and represented his school in tennis, athletics, gymnastics, and football competitions. His favorite subject was chemistry, but his headmaster told his father there was no demand for chemists in Australia. In 1916, age 18, Howard Florey began a medical degree at the University of Adelaide; highly disciplined and hard working, he came first in most exams. His father died in 1918, and it turned out that his father’s shoemaking business was insolvent. 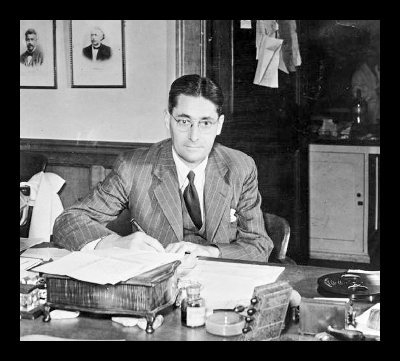 Howard Florey continued uninterrupted at medical school though, thanks to scholarships. He graduated as top student in 1921, and was awarded a Rhodes Scholarship for the University of Oxford. On the long voyage he served as the ship’s doctor. Having voyaged to the other side of the world, Florey immediately embarked on another major journey, an intellectual one, working in various locations, studying several disciplines, and carrying out increasingly sophisticated research work. 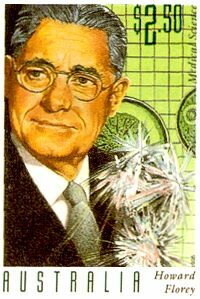 In 1923, he gained a first class degree in Physiology from Oxford and developed a new method to place transparent windows in living tissues. He traveled as medical officer on an expedition to the Arctic. In 1924, at Cambridge, he researched blood flow changes taking place in thrombosis. In 1925, he was awarded a Rockefeller fellowship taking him to Philadelphia to learn microsurgical methods, then Chicago to study mucus secretion. In 1926, he became a research fellow at the London Hospital. The work failed to excite him – he felt it was too routine. He found he did not enjoy living in London. In October 1927, age 29, he returned to Cambridge as a Pathology lecturer. Cambridge awarded him a PhD for his earlier research on blood flow. In 1932, he accepted an offer to become Professor of Pathology at the University of Sheffield. After three years at Sheffield, in 1935, age 37, Florey returned to Oxford as Chair of Pathology. He attracted a number of highly talented graduate students to work in his department. Also in 1935, a 28-year-old refugee from Nazi Germany, Ernst Chain, began lecturing at Oxford. Chain was a biochemist, and in 1939 Florey recruited him to his lysozyme research project. Lysozyme was a substance discovered in human body fluids and egg whites by Alexander Fleming in 1922. His research identified lysozyme as a microbe killer. 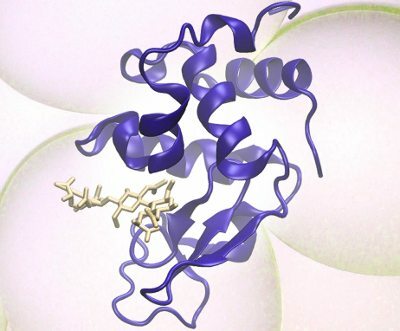 Florey, the pathologist, asked Chain, the biochemist, to discover the mechanism involved when lysozyme dissolved bacteria. Chain began a literature search and came across Fleming’s 1929 paper describing his discovery that Penicillium fungus produces a bacteria-killing substance Fleming named penicillin. Fleming had attempted to produce penicillin on a larger scale, but failed. His boss, Almroth Wright, had a generalized dislike of chemists and refused to allow them in his laboratory. The presence of a skilled chemist or biochemist would have been a huge benefit in terms of isolating, purifying, and concentrating penicillin as an antibiotic drug. Fleming had given a culture of his original Penicillium to Oxford’s School of Pathology, and it had been kept alive. In 1938, Chain began some exploratory experiments with it. The results were interesting. Florey, helped by a generous grant from the Rockefeller Foundation, decided to abandon lysozyme and study penicillin. Norman Heatley: Penicillium fungus growth. Ernst Chain, later with Edward Abraham: Penicillin purification and chemistry. Arthur Gardner and Jena Orr-Ewing: Penicillin testing on selected harmful bacteria. Howard Florey and Margaret Jennings: Penicillin testing on infected animals. In May 1940, Florey tested penicillin at a purity level of just 1 percent on mice infected with deadly streptococci. The four mice he treated survived, while four untreated mice died. Florey’s team published their results in The Lancet in August 1940 with the title: Penicillin as a chemotherapeutic agent. In the fall of 1940, the Battle of Britain was raging: Britain was fighting for its existence against Nazi Germany. Florey’s attempts to persuade British drug companies to produce penicillin failed – they were already running flat out on other war work. Florey’s response was to work with amazing intensity and vitality, turning his laboratories into a penicillin factory in miniature. By January 1941, he had produced enough penicillin to begin clinical trials on patients dying of bacterial infections in Oxford’s Radcliffe Infirmary. Working with the infirmary’s Dr. Charles Fletcher, six patients received restricted doses: one died when the penicillin supply ran out. The others survived. Florey’s team were thrilled. Increasingly, penicillin was looking like the long-dreamed-of magic bullet – a bacteria killer with no toxicity to humans. In June 1941, Florey and Heatley travelled to America to describe their penicillin production process. The U.S. government offered money to any American companies willing to produce penicillin on a large scale. The money was needed because, although Florey’s method was suitable for small-scale production, it was not suitable for industrial-scale production. Meanwhile Florey’s own lab-factory continued operating. By 1942, he had enough penicillin for a larger-scale clinical trial on 187 patients at the Radcliffe Infirmary, which was again successful. In December 1942, a girl was brought to the Mayo Clinic. A cut to her cheek had become infected and she had septicemia – almost universally and rapidly fatal. Even small cuts all too often led to death in this era, and the girl, in acute distress, was not expected to live long. A physician at the Clinic held a limited amount of penicillin for clinical trials. He selected the girl as one of his patients. She was completely cured in 12 days of penicillin treatment. The photo on the right was taken after treatment ended. See W. E. Herrel: Further Observations on the Clinical Use of Penicillin. Robert Gwyn Macfarlane was a clinical pathologist who helped with the clinical trials at the Radcliffe Infirmary. He became a great admirer of Florey, writing a biography in 1979: Howard Florey, The Making of a Great Scientist. In 1943, Florey travelled to North Africa to carry out penicillin trials on war wounds. 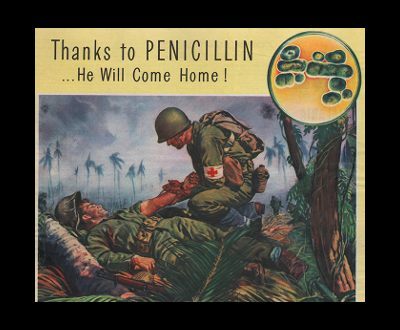 By the war’s end, penicillin had saved the lives of tens of thousands of allied soldiers. Florey did not patent penicillin or any aspect of its production, believing it would be unethical. A penicillin advertisement from Schenley Laboratories in 1944. Professor Howard Florey, age 46, in his Oxford office in 1944. Penicillin – Who to Thank? In 1995, Australia issued a stamp commemorating Florey. He was also remembered on Australian currency, his face appearing on $50 bills from 1973-1995. When it became apparent that penicillin was a wonder drug, Alexander Fleming’s employer, London’s St Mary’s Hospital, made sure its link to penicillin was highly publicized – good publicity helped bring in donations from the public. In its pursuit of publicity, the hospital received valuable help from one of its benefactors, Lord Beaverbrook, the owner of several major British newspapers. Fleming was more than happy to speak to the press about his work. Florey, however, instructed his team members not to speak to the press under any circumstances. He knew that only tiny amounts of penicillin were available and he did not want to raise the public’s expectations of a miracle cure. In the world’s eyes, Fleming became the big name associated with penicillin. Florey and Chain’s crucial roles in turning Fleming’s discovery into an antibiotic drug were understated – a situation that did not change when the Nobel Prize was shared between the three scientists. In October 1926, Florey married Dr. Mary Ethel Hayter Reed. They had met as students in Australia, and she joined him in London. They had a daughter and a son: Paquita and Charles. Mary, a pathologist, played a major role in the first big clinical trial of penicillin in 1942. In 1952, she began publishing her book The Clinical Application of Antibiotics, in four volumes. Florey enjoyed classical music, gardening, photography, and shooting home movies. In his late 50s he took up oil painting. In 1962, age 64, Florey retired from scientific research, becoming Provost of Queen’s College, Oxford. In 1966, his wife Mary died. In 1967, Florey married Margaret Jennings, a member of his original penicillin team. Howard Florey died at age 69 of a heart attack on February 21, 1968 in Oxford – he had suffered angina for a number of years. Survived by his children and second wife, he was buried in Oxford’s St. Nicholas Churchyard. A month after his death, a memorial service was held for him in Westminster Abbey. "Howard Florey." Famous Scientists. famousscientists.org. 20 May. 2018. Web. Image of Robert Gwyn Macfarlane by Jmcperth under the Creative Commons Attribution-Share Alike 3.0 Unported license.